I grew up in a generation that seemed to be surrounded by music…classical music. It was in concert halls, churches, movies…and cartoons. I didn’t know what the music was at the time, but I recognized it when I heard it in its musical context in concerts or on our FM radio station. And I think that surrounding of us with these pieces gave us an appreciation for music without it being forced on us. It didn’t take long before that became the norm, and music was shoved aside. Not just in cartoons, but also in school as well. And we’ve become poorer for it. Music has become an “extra” far too often in schools…something that is first on the chopping block when budgets need to be cut. And, at least in my own denomination, music–at least classical music–is often seen as something that might be nice but that doesn’t relate well with the “average” person (whoever that might be!). To sponsor a fine arts program? well, if there’s money in the budget, we might be able to do that…but what’s the purpose? Where’s the value? There have been lots of studies that show that music (and the other arts) help children learn. They help us connect to other people…to the world around us…to the creative parts of who we are. Music is a language…a language that helps us express emotions and feelings that we have no words for. It helps us connect to the Divine. It is a universal language, even if it is expressed in different forms. And so…why not music? Why not…in our schools, our homes, our churches? This weekend I attended a retreat. It was a wonderful retreat with the theme of “Hungering and Thirsting”…looking at those things that we hunger and thirst for. Why? and how can we feed that hunger and quench that thirst? One of the questions that was asked in one of the sessions was “What nurtures your soul?” We were given five minutes to write down as many things as we could think of that nurtured our souls, and then we were given a few more to write another list of spiritual disciplines we practice regularly. Then the question was, “What do you see when you look at the lists?” For some of us, the lists were completely different. Some of us had one or two of the same things on both lists–and a very few found that their lists were very similar. As we talked more, we began to realize that in reality, the things that nurture our souls can–and should be–the same thing as the spiritual disciplines we practice regularly. It’s not that there’s a huge difference between the two things–but the primary difference is doing them with intentionality. As I had worked on my list, I realized that I had not put down any of the things that you might expect to see from a minister/preacher’s kid…i.e., going to church. But because I am involved in providing ministry on a regular basis, much of what I do in preparation (i.e., studying, practicing hymns and service music, writing) is something that also nurtures my soul…and can easily be a spiritual discipline. But I also realized that the very first thing I had written on my first list was also something that easily gets shoved aside when other “important” responsibilities demand my time and attention. What was it? Writing poetry. That is often how I make sense of what is happening in my life, in the lives of people around me, in my world. When I let it get shoved aside, I realize I am tamping down something that is at my core…a gift I have been given…a talent I need to honor. We also talked about how easy it is to spend time on those things that nurture the soul when we draw apart for intentional focused time. But then Monday morning comes…what then? We were challenged before we left to let this Monday morning be different…to focus on one spiritual discipline that nurtures our souls and to spend time doing it just this week–and at the end of the week, to evaluate what happened. How do we feel? What changed in us? I’m going to find/make time to do some writing every day this week. I’ll share with you the end of this week how it went…what changed…and how my soul was nurtured. How about you? Want to join me? Today has been a very difficult day in the life of my faith tradition. Due to a number of factors–some easily understood…some apparently beyond our control…some very possibly the result of some unwise decisions–many people who worked for my church found out that they no longer have work positions. Others will find out tomorrow. I’ve been through that–and it’s devastating. Working for your faith is more than just “a job”. For many, it’s a response to a spiritual call–and to be told that there is no longer a place for you because of finances leaves you wondering where your place is. Relationships will be irrevocably changed…relationships between individuals…relationships between individuals and the institution…and for some, relationships between themselves and God. Can they be healed? Yes…and the only reason I can say that is because I experienced that healing. But will they ever be the same? No. There will be scars… The question is, what kind of scars? 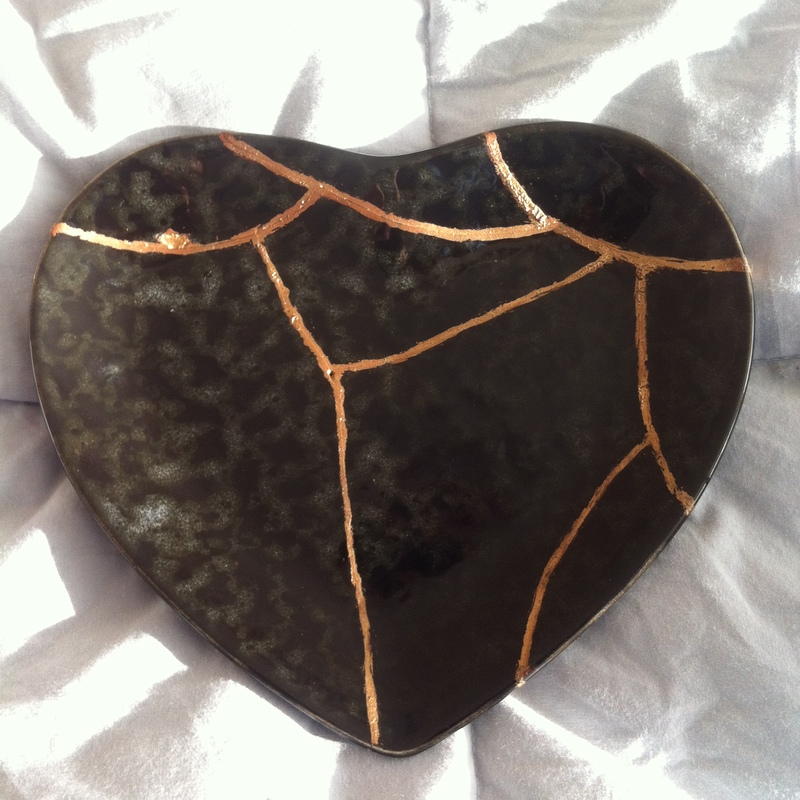 There’s a pottery technique known as “kintsugi.” When something is broken, it is mended with lacquer dusted with gold. Rather than trying to make the cracks invisible–to ignore the brokenness–it is embraced and made part of the history of the piece…a way of finding beauty in brokenness. We are broken in many ways right now. There is much pain…much anger…much despair. But I hope that through our prayers and support, we can find healing and reconciliation both as individuals and as a faith tradition. Our histories–sacred and secular–are full of cracks and brokenness. What we do with them–whether we are able to accept them and find beauty in them–determines how we will live going forward. When I was in high school, I loved to write poetry. In fact, I loved writing in many of its forms…and for a while hoped to make a career in some aspect of the writing field. However, that didn’t happen. While my parents were supportive in many ways, my thinking about a career in writing didn’t get supported. It wasn’t a logical career choice–and they wanted me to make sure I had a career that I could count on. So I went into education–English education. I taught for a few years and then left to rear a family and support my husband in his education career. I went back to school for an advanced degree in music–but that wasn’t really for a career choice either. Later (much later) I did some college teaching in music…fun, and something I might have pursued more significantly if I had started it earlier. Periodically I would write…some poetry…and more recently, this blog. Blogging makes you kind of vulnerable. At least it can. You can decide how much of yourself you want to put out there, and while some of my posts have been pretty personal, I didn’t feel that vulnerable. I’m not sure why, but it feels like when I write poetry, I’m letting people pretty deeply inside. And that IS scary. Part of the reason why I have let very few people read any of my poetry is because I was afraid of how they would react…and that reaction would touch the core of who I am. I didn’t want to hear “That’s nice”…which is what I had heard when I showed some of those early poems to my parents. I wanted to know that my poetry somehow touched something in someone else. I finally showed some to my husband. His reaction was what I wanted and needed…but I still needed something else. I needed to know that someone who didn’t have a vested interest in a relationship with me could be touched. So I finally got up nerve to ask a friend who had been an editor if she would look at my poems–and she said she would. She let me know that she had almost finished them–and wanted to meet for lunch. That was fine…but what was even more important was that she said she had been enjoying them…and there were some she wanted to read again! We met today. She pulled out some of the poems that really spoke to her–and that she encouraged me to submit to some magazines. I don’t know that she really knows how much that validation meant to me. It was a “Yes, you can…” experience…a support I’ve been waiting years for. It’s never too late…so watch out, world. Here I come! Good-byes are never easy. Sometimes they’re not as difficult because you know you’ll see the person again, even if it’s not going to be right away. But some are much harder. The final “good-bye” is the hardest of all. Even some of them are less difficult…especially if the person has lived a long, full life and is at the point of being ready. My parents were both like that. My father was alert and cogent right up to the day before he died. My mother was less so–she struggled with dementia, but again, was still able to have fairly cogent conversations until close to her death. But this morning I took part in one of those difficult good-byes. Velma Tyson was four years younger than I am. I know that I’m entering into the older years of life–but to see someone I know die at the age of 62 is a rather vivid reminder! Velma was an extremely gifted musician…a piano teacher…accompanist for the Independence Messiah Choir for 30+ years…accompanist for the Jacomo Chorale…and involved with many other music groups that I’m not aware of. While I didn’t know her well, we had a friendly relationship, and I always appreciated her smile and warm greetings. About 18 months ago, she was diagnosed with cancer. She fought it–and was apparently beating it surgically. But–as is often the case–chemo and radiation were recommended as follow-up treatment to ensure no stray cells…and it seems that she had issues with those treatments that caused her to die far too soon. And at the end, there was a sending forth in praise. I had been asked to play for however many members of the Independence Messiah Choir and Jacomo Chorale who could be there to send us out with a rousing performance of Handel’s wonderful “Hallelujah Chorus.” With her service being on a work day, we didn’t know how many people would be there…but about 50 were able to join in that performance. And yes, it was a performance…but also a testimony on behalf of Velma. Hallelujah!…and good-bye to a life well lived.